Step 1 Slice apples and toss with lime juice to prevent browning. Step 2 Melt butter in large soup pot, add onions and cook over medium-low heat, stirring occasionally, until soft, about 5 minutes. Step 3Stir in apples and lime leaves (or half of lime zest). Cover and cook, stirring occasionally, until fruit has softened, about 5 minutes. Step 4Add broth, coconut milk and water. Reduce heat to low and simmer, partially covered, until apples are completely mushy and broth is infused with lime flavor, about 10 minutes. Remove lime leaves and reserve. Step 5Puree soup in blender or food processor until smooth. If needed, return soup to pot and reheat. Season to taste with sugar, salt and pepper. Garnish with lime leaves or remaining lime zest. In Recipes-list.com we have selected the most viewed recipes from category - Soups Vegetarian . Enjoy the best recipes specially selected for you! 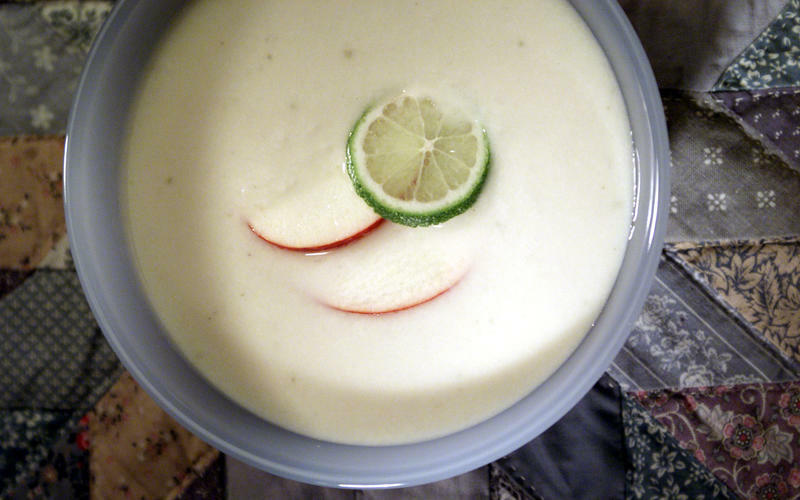 Apple and Coconut Soup is the right choice that will satisfy all your claims.